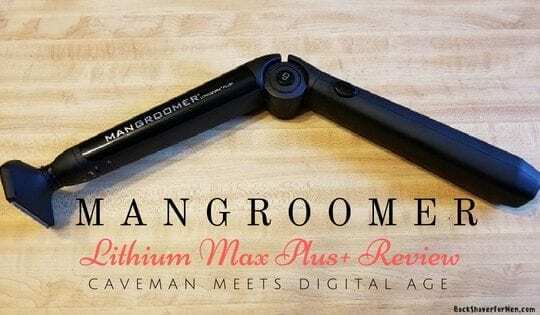 What Is The Giraffe Razor Extension Handle? Like the name implies, this is a long handle (like a giraffe’s neck) for better reaching areas of the body with minimal effort. 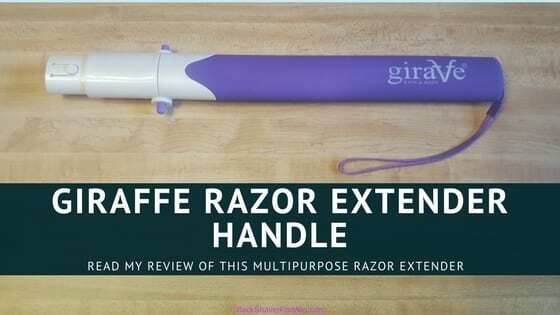 The Giraffe Razor Extension Handle is a multi-purpose extension razor, an important note here, is mainly for designed for people with mobility issues but…not limited to that alone, either. As you could use it regardless of mobility issues, or just overall for a more pleasurable shave. Less bending over and stretching. Or…You guessed it…Back Shaving! 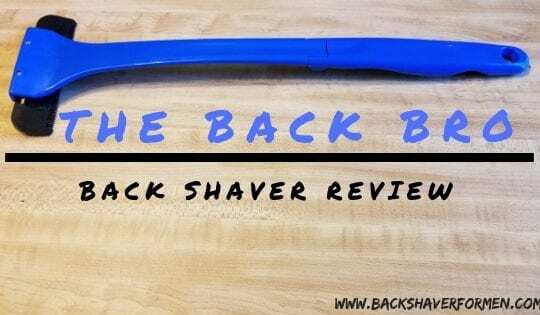 In this Giraffe Razor Extension Handle Review, I hope to guide you through back shaving with The Giraffe and help determine it’s effectiveness at this task. Go forth now and continue reading onward and upward. Instructions are on the box. This shaving system consists of just three possible parts. A fully adjustable handle and two different head attachments for differently sized razors. The shortest setting is 15 3/16″ and adjustable at 1″ inch intervals to 20 3/16″ inch at its longest. More than long enough for both leg shaving and back shaving. 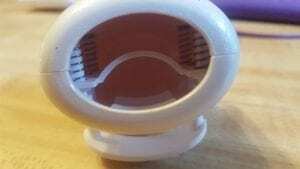 At about 5 inches from the top to the bottom is where there is a pivot point where also are located two buttons. These buttons and be depressed to adjust the angle of the shaver. There are for settings here from straight to a full ninety-degree bend. This is a really important feature and Ole long neck here gets this righttttt. How Does The Giraffe Perform? Keep this in mind that The Giraffe Razor Extension Handle is primarily for people with mobility issues for shaving your legs. 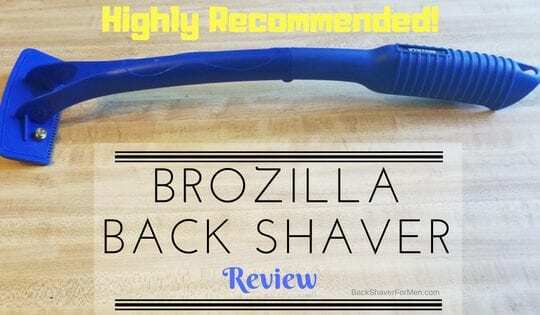 Having said that, this makes a pretty darn good back shaver, although considering that most people will be using a width limiting standard sized razor. (Although you could use the Razorba G.O.A.T razor, see below). As for a regular beard, shaver cannot compare to the efficiency of a dedicated wider back shaver. For the most part, it holds a razor to adequately shave one’s own back with. It took a little under 30 minutes to adequately shave my back with the Giraffe with a standard face razor. I also shaved my back dry as I know this works the best for me with shaving with a standard razor. The problem with using a standard razor is that it often clogs very easily with the longer back hair. It wasn’t designed to shave back hair, it’s designed to shave facial hair. This adds to shave time as well as to cleaning and unclogging time. The oval-like handle let me quite easily index the razor shaving head while shaving. It didn’t leave me guessing at what angle I was shaving at, it just always was where I wanted it, at the correct angle. This is a problem with some of the back shavers I have reviewed in the past, The Giraffe doesn’t have this problem at all. The Giraffe will hit all the impossible angles you get when you try and shave your back. If you don’t mind shaving with a purple razor extension handle, but who cares when you’re in the privacy of your own shower. Right, men? As we puff your chest out. Me…I don’t care what color it is, as long as it works! All kidding aside, it performs pretty darn well and especially considering this is designed mostly for people with mobility issues. This might be a great shaver to share with the wife as well. I know from personal experience. I had my wife try a razor extender for shaving her legs and she hasn’t gone back to using a regular razor yet. She has yet to try The Giraffe, but I think she would love it. She just loves not having to bend over as much. So you married men if you’re looking to for a gift for your significant other. Ding, ding, ding. Here lies the answer, to back hair and a razor extender for her. Smooth legs and smooth backs. Smiles all around. Anybody looking to make shaving your legs easier. Multipurpose usability, can be used as a back shaver and also a leg shaver. The overall product design is well thought out. You can tell a lot of thought and work went into its design. The handle allows for easy indexing when shaving. It’s pretty much thoughtless, and this is a great thing. Any product that is designed for people suffering from any debilitating mobility issues should be applauded. Makes a great gift for your wife too. 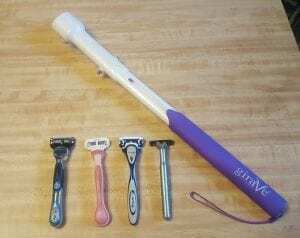 All in one razor extender. Back, legs, or wherever. Head attachments securely locks into the handle. This is where The Giraffe shines! The pivoting head works well for getting all the angles for effective back shaving. There are four settings, sure to work for whatever situation you can throw at it. If you can shave your back with it, you can shave anywhere else with it, despite mobility issues. Fully extended, The Giraffe should reach any part of the back or the bottom of any leg easily. I love the lanyard, as in the case if you’re immobilized, this guarantees that you won’t drop it. Thus having to avoid that discomfort of picking it up if you drop it. You can choke up on the handle anywhere and get the same grip. The ability to adjust handle length. 15 3/16″ inches to 20 3/16″ inches, in one-inch increments. A slight excess of movement in main pivoting hinge point. Not a big issue, just a slight give when shaving. The locking mechanism is hit or miss for holding a razor securely inside the head razor attachment. As most of the razor was adequately held securely in place. My old Gillette Sensor spun like a Whirling Dervish, as the giraffe locking design works better with rubber than hard plastic razor handles. For a back shaver, you’re limited to the size of the razor you’re using. 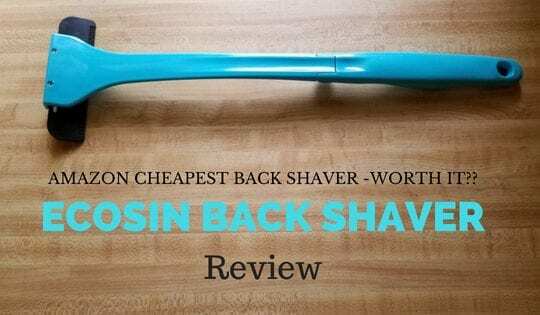 As the back is a big body part, and it might not be the most efficient method of shaving your back. But as a leg shaver this just great. Just compared to other larger width razors from other back shavers, as some dedicated back shavers have 4 to 5 inches in width. 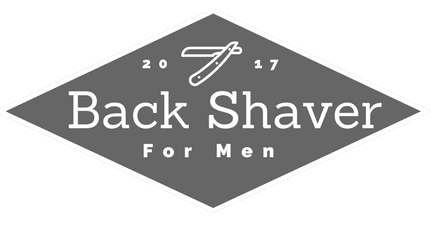 You’ll be shaving with a standard width face or leg shaver, this increases the amount of time and effort. Clogs with hair when used in conjunction with a standard beard razor. Requires constant cleaning while shaving your back. Keep that water running…Tap, tap. The look inside the large universal razor attachment. Razorba G.O.A.T ( I tested this wide blade 4 1/2 inch blade and The Giraffe held this Goat very securely). Head over to my page on Tips On Shaving Your Back. Make sure you use the right attachment for whatever razor you’re using. The smallest head attachment is for the standard men’s razors and disposables. While the larger handled women’s razors, you should use the largest head attachment, some bigger beard razors, and most dedicated women leg razors. See the list of Compatible Razors (above). Read and follow the written directions on the back of the box, for the best optimal performance. When shaving your back it’s important sometimes, to listen for the correct sound a razor makes when it’s shaving in the most optimal angle. This helps maintains the right angle without being able to see it. Or when using a mirror to really confuse your hand-eye coordination. If you’re looking for a more time efficiency shave, You might want to check out the Razorba G.O.A.T for shaving your back with. As the blade width is a 4 1/2 inches wide as compared to a standard razor width of roughly 1 1/2 inches. You can read my full review of the Razorba Goat here, Razorba GOAT Wide Disposable Double Razor Review. One can tell…usually, of all the hard work behind the scene, when looking at and/or using a product. This is the case with The Giraffe Razor Extension Handle, as it positives outweigh it negatives and more importantly, it does the job with little complaints. There is a lot of hard work that went into this. This is especially important because this is designed first as a leg shaver, with being a back shaver secondary. It is also mostly marketed to that fact as well. I have seen similar designs targeted at strictly back shaving fall far below The Giraffe performance and design. This will shave a back with a standard razor quite nicely, as nicely as a beard razor can shave a back. As the fault is NOT with The Giraffe but with limitations of the razor you’re using. It doesn’t compare to the efficiency of a high quality dedicated back shaver. Just keeping it real here. But the strength of The Giraffe is the multipurposeness and quality of design. Able to giraffe kick most body hair into submission. Easily reaches the whole back quite nicely. Some issues with some razors not compatible with The Giraffe. Okay, razor lockdown system. not the best not the worst.